MackieMade Paper Creations: Paper Sweeties September 2016 Release Rewind! Paper Sweeties September 2016 Release Rewind! To create this card I stamped all the images from the new September Release-THANKFUL-all over a piece of Tim Holtz watercolor card stock with Black Archival ink. I watercolored all the images with my Gansai Tambi watercolors. I cut a 1 3/4 X 5 inches strip of vellum. I stamped THANKSGIVING-from the older HAPPY EVERYTHING stamp set with Versamark ink and heat embossed it with black embossing powder. Next I diecut the older HAPPY Sweet Cut 4 times with black card stock. I layered and glued these together to give the word some depth. All I had to do was put the card together! I am going to send this card to my sister at Thanksgiving!! I hope you have enjoyed seeing the different ways you can use these new September stamps and Sweet cuts! Especially the THANKS Sweet Cuts! It will be one I will grab lots of times!!! 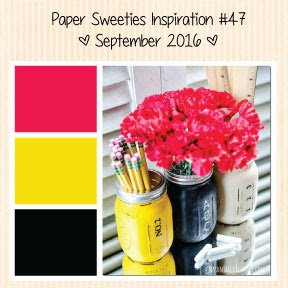 Please join our Paper Sweeties September Inspirational Challenge! You could be the lucky winner of a $20 Paper Sweeties gift card! Awesome stamped background, Mackie!! Love the vellum with die cut, too!! I like your playful design Mackie, this is pretty!! Such a fun and cheerful card Mackie! Thanks for the inspiration! Paper Sweeties September 2016 Release Party!